Fixing gullies to reduce sediment run-off is challenging and both governments are investing millions of dollars in a range of pilot remediation projects that are delivering promising early results. Initial findings from a Reef Trust gully erosion control project delivered by Cape York Natural Resource Management show sediment loss was reduced by 4000 tonnes in the year to June 2018. The holistic approach included reducing grazing pressure, improving native vegetation health and strategic gully stabilisation works. Wetlands help to improve the quality of water flowing to the Reef by removing sediment and other pollutants. 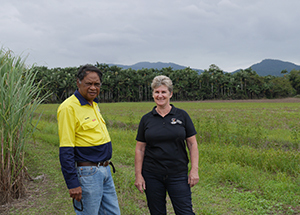 Through the Babinda Swamp Constructed Wetland project, Liz Owen and Dennis Ah-Kee of Jaragun Natural Resource Management have restored a wetland which acts as a filter to treat water running off nearby cane land and helps them care for country. “Protecting the Great Barrier Reef is not just an Aboriginal problem, it’s not just a farming problem, it’s everybody’s problem,” Yidinjii Babinda Elder Dennis Ah-Kee said. Businesses, communities and individuals are also supporting efforts to improve water quality with more than 400 donors including the Prior Family Foundation, Tiffany and Co, and Virgin Australia contributing to Greening Australia’s Reef Aid trial to reduce sediment run-off from gullies. Along with $2 million in matched funding from the Queensland Government, the Innovative Gully Remediation Project is trialling a range of techniques in the Burdekin with plans to roll out the most cost effective solutions at erosion hotspots throughout Reef catchments.